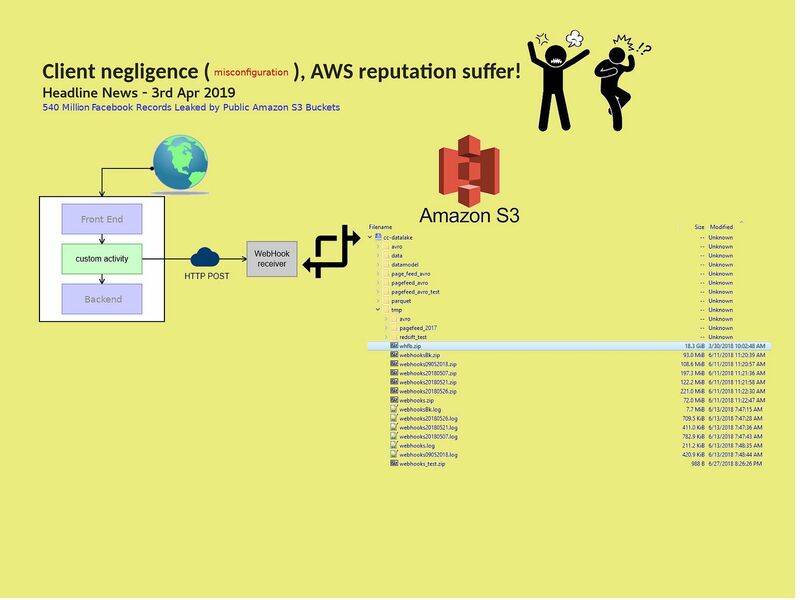 Preface: Splunk is powerful, it can extract cookie of web connections. If client connection still alive, hacker can hijack and get the connection. 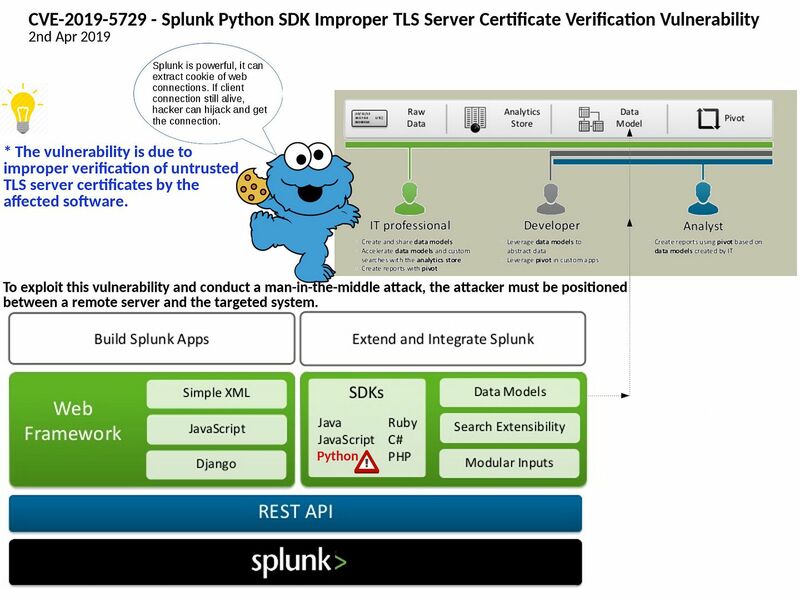 Vulnerability details: A vulnerability in Splunk Python SDK could allow an unauthenticated, remote attacker to bypass security restrictions on a targeted system. An attacker could exploit this vulnerability by executing a man-in-the-middle attack to bypass access restrictions on the system. Preface: Linus Benedict Torvalds, he is the principal developer of the Linux kernel, which became the kernel for many Linux distributions and operating systems. 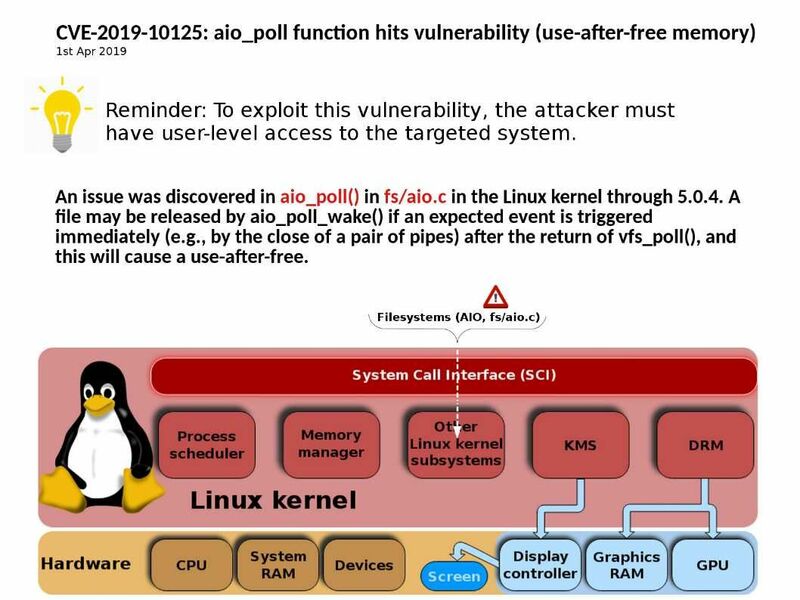 Vulnerability details: An issue was discovered in aio_poll() in fs/aio.c in the Linux kernel through 5.0.4. A file may be released by aio_poll_wake() if an expected event is triggered immediately (e.g., by the close of a pair of pipes) after the return of vfs_poll(), and this will cause a use-after-free. 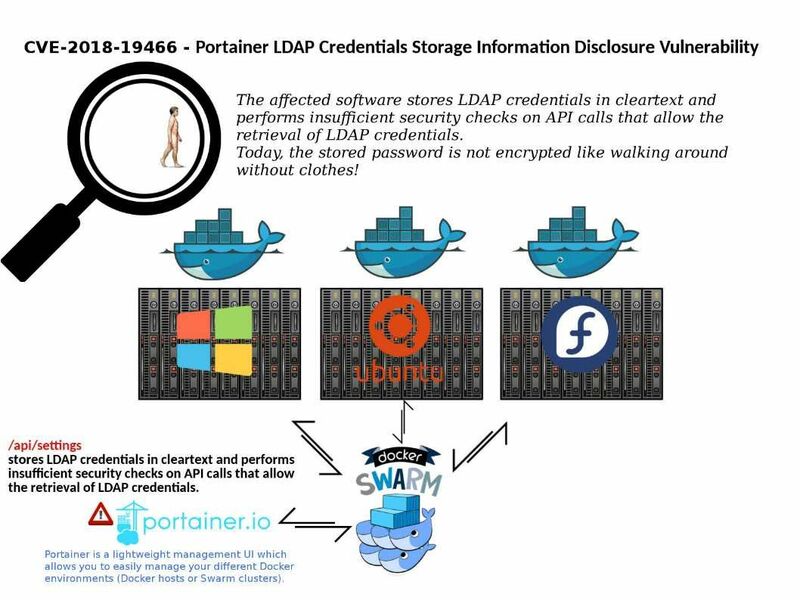 Impact: An attacker could exploit this vulnerability by executing an application that submits malicious input to the targeted system. A successful exploit could allow the attacker to execute arbitrary code and completely compromise the system. 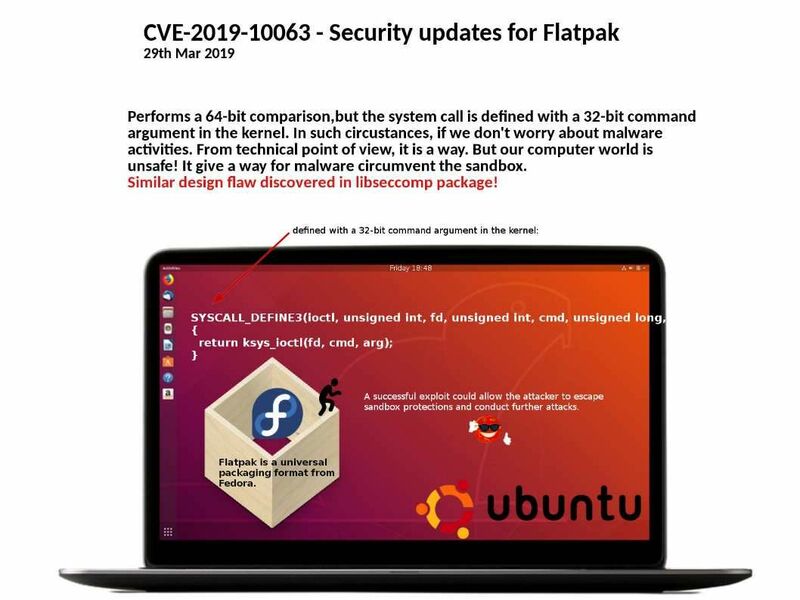 CVE-2019-10063 – Security update for Flatpak, 29th Mar 2019. Preface: Coding is the process of translating and writing codes from one language to another support operating system platform. If Linux user found that the new application not available in the App Stores. He can do the installation via the DEB or RPM packages. Some of them are available via PPAs (for Debian based distributions) and if nothing, one can build from the source code. Flatpak provide a 3rd way. 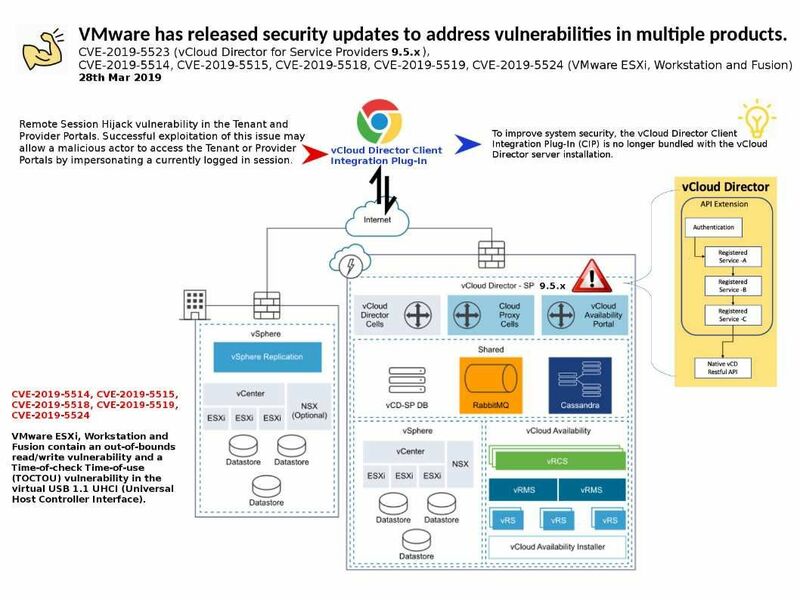 Vulnerability Details: The vulnerability exists because the affected software does not use the seccomp filter to prevent sandbox applications from using TIOCSTI IOCTL. The snapd default seccomp filter for strict mode snaps blocks the use of the ioctl() system call when used with TIOCSTI as the second argument to the system call. But it didn’t! The fact is that restriction could be circumvented on 64 bit architectures because it performs a 64-bit comparison,but the system call is defined with a 32-bit command argument in the kernel. Similar design flaw discovered in libseccomp package! Observation: Similar design flaw might found soon in other software. Synopsis: session hijacking, sometimes also known as cookie hijacking is the exploitation of a valid computer session(sometimes also called a session key) to gain unauthorized access to information or services in a computer system. In software development, time of check to time of use (TOCTOU, TOCTTOU or TOC/TOU) is a class of software bugs caused by changes in a system between the checking of a condition (such as a security credential) and the use of the results of that check. Out-of-Bounds Read. The program reads data from outside the bounds of allocated memory. Buffer overflow is probably the best known form of software security vulnerability.